Lovingly restored to the highest modern standards, the Cascina Del Forno is a stunning Piedmontese farmhouse that blends original 18th Century and modern design features. It's generous open plan kitchen, gives wonderful views out from the huge French windows over the landscaped herb garden, to the rolling hills and Alps beyond. It's fireplace next to the long dinning table make it a wonderful place to relax over a delicious meal. The living room also has a fire, 2 sofas, one of which can be converted into a 2 person bed. This delightful room with original brick vaulted ceilings is a wonderful place to relax, watch TV or the large collection of DVDs. Upstairs there is a generous shower room, a double bedroom with balcony, a smaller bedroom with two twin beds suitable for children. The magnificent master bed room includes an en-suite bathroom, separate shower, WC. From the large double bed you can enjoy charming views of Mombercelli Castle and on clear days, the Alps in the distance. For larger parties of up to 10 people, or if you require 3 full double beds, rental of an additional double bed and bathroom can be arranged with the owner, in a wing of the house, that is usually closed to guests. Terraced garden: The house forms part of a secluded L-shaped courtyard, made up of three houses and their attached barn, all owned by the proprietor. Two of the houses have been fully restored, the 3rd is awaiting restoration. Guests have sole use of the whole site. 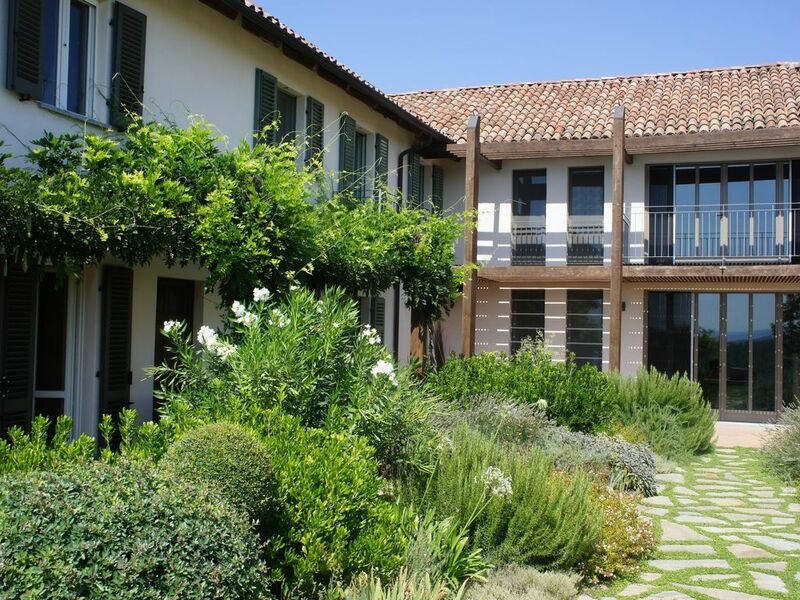 There is a landscaped, terraced garden with a vegetable patch and a herb garden that guests are welcome to enjoy. A small pond with fountain, mean that Cascina del Forno is unsuitable for toddlers, and small children will need to be supervised at all times. The house is equipped with badminton, a ping-pong table and boules. Meanwhile, a spacious shady gazebo with gas barbecue grill, sun lounger and hammocks, make it idyllic for families or adults. It is the perfect place to sit with a glass of local Barbera or sparkling Cortese or enjoy a lazy meal, with the panoramic views of the valleys, and on clear days, the distant Alps. Monferrato: a food & wine paradise: The Monferrato region is a foodie's paradise, well known for its white truffles, wild boar, fresh pasta and Nutella as well as glorious wine (Barolo, Barbaresco, Barbera, Nebiolo Arneis and Moscato). Bra and Alba, the home of the Slow Food Movement are a short 30 minute drive away. Indeed, Cascina del Forno is located in Mombercelli, one of the key centres for white truffles. Our neighbour at the bottom of the hill is one of Piedmont's premier truffle experts who lectures regularly at Eataly. During the truffle season in October/November he is happy to take visitor's truffle hunting on his land or welcome them into his agriturismo restaurant, that specialises in dishes using truffles. But street markets held in every local town, offer an abundance of fresh local produce any day of the week you decide to go shopping. Wine tastings and vineyard tours are a wonderful way to discover the authenticity and passion of the local independent winemakers. Particularly interesting are the magnificent cellars or ‘underground cathedrals’ in nearby Canelli, which have been designated a UNESCO world heritage site. Festivals & other local activities: If you like swimming, June-Sept Mombercelli has a wonderful outdoor communal pool with jacuzzi, tennis court and football pitch and bar/restaurant. Its a great place to watch and meet the locals. There are lots of picturesque marked cycling routes on the local highways and byways. Walking and hiking in the local lanes or the Tanaro National Park are also a delight. Experience one of the many annual local festivals, the most famous being the Asti Palio each September, older than the one held in Sienna. Then there is the medieval re-enactment of the Siege of Canelli each June in which all the locals dress up to become protagonists in the battles, cars are banished from the streets of the old town, and replaced with bales of hay, craft demonstrations and pop up street banquets. Meanwhile, there is the hilarious donkey palio in Alba, to rival & mock the equestrian version in Asti, or the renowned International Truffle Festival in Alba each October. We had a really good time in you fantastic house. It is an ideal place to relax. The weather was better than expected so early in the year. We had only two days snow and rain but all the other days a lot of sun. The house is very comfortable and very well equipped. We were very impressed by the large and very nice bed/bathroom. We did some hiking in the region and also in the Aosta valley. We visited Asti, Alba and Turino. These are very nice and interesting towns. Thanks a lot that we could experience this good time. We fell in love with the rollling hills of this region, and when we began house hunting in Piedmont. While initially we were looking for a house nearer to Torino in the foothills of the Alps, it was the gentle undulations of this landscape that the took our breath away and made us plump for the Barbera region in the end. The colours of the vineyards and fields and the views across hills to the distant Alps and Apennine mountain ranges made each day a particular pleasure. In 2007 we decided to move to Mombercelli in order to manage and experience the adventure of the renovation work that we were undertaking on the house, expecting to stay for just one year. But it proved too lovely to leave and so we lived permanently here for 2 years, putting the children into local schools, running out businesses from this hill-top position and becoming fluent in Italian. We now flit between London and Mombercelli, and are fortunate in being able to come back and slot into our Italian home and life for 10 weeks of the year, during school holidays. The remainder of the time, it is nice to be able to rent it to holiday visitors, and share this little known but wonderful area with the wider world. We fell in love with the secluded courtyard feel of the property, and adore its panoramic views over the hills, to the distant Alps. From the road, the house looks like it has turned its back to the world. But as soon as you drive through the arched gates of the property, you feel like you are in a private, secluded haven. Up until 30 years ago, this L shaped series of three houses, used to be home to and extended family of 37 people. It is now a generous and secluded space for guests to enjoy solely made up of 2 renovated houses, and one un-renovated houses around a landscaped herb garden. The local passion for top quality food is extraordinary. I have learned how to make tomato passata, bagna cauda sauce and fresh pasta thanks to my neighbours interventions. I have been truffle and porcini hunting in the autumn mists. It has been a wonderful adventure that has enriched my life enormously. We have renovated the the house to be as eco-friendly as possible. With solar shading/balcony, large windows to let in as much daylight as possible, solar panels, lots of insulation in the wall to make it cosy in winter and cool in summer. We love to sit at the kitchen table and look at the changing light of the panoramic views across the herb garden, rolling hills and beyond to the Alps. Indeed we have had lots of appreciative comments from guests who have enjoyed helping themselves to the fruits of the persimmon, fig and peach trees in the garden, depending on the season. While we have chosen not to build a swimming pool at the house, this does not mean that there is not great swimming to be had locally. Mombercelli public pool is an amazing amenity, and a great place to do some serious people watching. Open from the beginning of June until the beginning of September, this large pool is landscaped with a garden, cafe, football pitch, tennis courts, beach volley ball, and jaccuzzi. The master bedroom bathroom is en-suite, and includes a very large double ended bath. There is also a large separate shower, WC and bidet. The Shower Room has a very large walk in shower, basin, bidet and WC. There are two further cloakrooms with WC. Fully gas centrally heated, with additional hot water heating from solar panels. There are 2 dishwashers available, one built into the main kitchen and second in pantry. Large 120cm wide oven, with grill and 6 ring gas hob. Pop Corn Maker, microwave oven, soup blender, orange squeezer, hand mixer, juicer. A great place to hang out and cook together. The main cooking station has a breakfast bar attached and we fine we congregate here and chat while we are preparing meals together. Dinning table in the main kitchen, we have two high chairs one suitable for babies and one for toddlers. Ping Pong, badminton, boules available. Landscaped garden with herb garden, and fruit trees which guests are welcome to enjoy. Tennis courts for hire at the Mombercelli Public Pool, 3 minutes drive from the house. Mombercelli Public pool has an olympic size pool, separate Toddler pool, and Jacuzzi. It is just 3 minutes drive from the house. Children welcome, but due to the sunken pond and fountain in the garden the property is not suitable for toddlers, and small children must be supervised at all times. All the windows have in-built, open-able mosquito screens, and so natural ventilation and electric fans are sufficient to provide the cooling necessary. The garden includes 1hammock, 3 sun loungers. Boules, and Badminton, ping pong,and a basket ball hoop are also available. The property has a cat flap, so cats and dogs are considered. We really enjoyed our stay in this beautifully renovated home. Once the fog finally cleared we got to enjoy the gorgeous mountain and valley views. The house is completely outfitted for anything you might need. So glad you enjoyed your stay. The autumn mists are legendary in Piedmont, its what helps the white truffles grow, but I know just what you mean about the dramatic change when they lift and the views from the house of the distant alps are revealed. Please do come again! We had a wonderful week's holiday. Very relaxing for adults with plenty of space. Young children with us had great fun on the trampoline and playing with games and toys. The view was stunning and it was a delight to see the flowers, insects and amazing birds around, especially the bee eaters, swallow tail butterflies and humming-bird moths. And what a lovely house. So glad you had a great stay! We love the garden in July too.! Please come back and visit us again. The house is a lovely place, quiet, ideal to explore the gorgeous Piedmont country side. The terrace overlooking the country side was stunning. No better place to have breakfast. Overall we had a wonderful experience. We had a wonderful five days relaxing in the house , looking at the view, going for walks and doing day trips to so many unique places. The house is so comfortable with everything you need and more. So many personal touches and history. Our hosts were friendly and responsive to all our questions. So glad you had such an enjoyable stay! Please come again next time you are in Europe. Great getaway in Piedmont, lovely views right across the valley to snow capped mountains. Short drive to all of the great wine areas, and some lovely restaurants. Loved the open plan kitchen, perfect for experimenting with local produce, and real fireplaces created a great atmosphere on a night. We were very lucky with the weather as it was end of February. Incredibly comfortable bed and lovely modern bathroom. So glad you enjoyed your stay and the weather was so perfect. Thanks for choosing our home for your holiday! Please do come again soon! We spent a wonderful, peaceful week at the Cascina del Forno which is situated in a very quiet hamlet on the top of a hill overlooking a very beautiful wooded valley and with distant views to other hill-top villages. The main part of the farmhouse has been sympathetically restored, with the traditional brick vaulted ceilings and the wooden roof trusses giving great character to the building, but with nicely designed modern conveniences and design touches that helped make our stay relaxing. A pleasant courtyard garden with its gazebo made for a great place to eat al fresco and enjoy the view. Mombercelli is well placed for trips to the great Piedmont wineries around Asti and Alba, plus not so far from Milan or Turin for a bit of Italian sophistication. So glad you enjoyed yourself. Please come back again soon! Mombercelli is a charming village set in the rolling hills of Barbera and Moscato wine country. Located in the heart of the white truffle producing area of Piedmont, Mombercell an easy drive from the epicentre of the Slow Food Movement in Bra and Alba, with it's International Truffle Festival. It is also just 15 minutes away from the the Provincial capital Asti which is famous for Italy's oldest horse racing Palio and International Wine competition. Whether you want to browse in the weekly market of Nizza Monferrato or go wine tasting in Barolo, hiking or golfing, you will be spoiled for choice. Indeed, Mombercelli is ideally located for day trips to the beach on the Ligurian coast, skiing or mountain trekking in the Italian Alps, or shopping for designer clothes in Turin or Milan. Although a relaxing get-away, off the beaten tourist track, Cascina del Forno is easy to get to, being equidistant from 5 international airports: Genoa, Turin and Milan Malpensa and Milan Linate, all around an hour’s drive away. 27 holes. Blue course, 9 holes, 3249 m, Par 36 - Yellow course, 9 holes, 3175 m, Par 36 - Red Course, 3069 m, Par. 36. Designed in the hills of Monferrato, this scenic course is particularly interesting for its high trees, the sometimes tough lies and the length of some of its holes. Limone gives access to the Riserva Bianca skiiing area of which the Maneggio area is dedicated to beginners. The Riserva Bianca (White reserve) can satisfy downhill skiing enthusiasts thanks to its 80 km of runs covered almost entirely by artificial snow systems and served by 16 lift systems, with stat-of-the-art tele cabins and chair-lifts. The tracks vary in length and difficulty, with some runs designed for beginners and others which have hosted, among other things, the training sessions of the Italian and French national teams. The width of the runs makes them ideal for use by snowboarders, while those boarders who prefer to practise their acrobatic moves can do so in the 3500 m² of the snow park at Limonetto, equipped with half pipe, kickers, box and rails. There are a total of 40 slopes providing 80KM of piste. A day's pass can be as little as €25 for adults and €6 for children. * Rate Includes: fresh linen, towels (bath towels only, does not include beach towels for swimming), electricity & heating and post-stay cleaning. *In some circumstances we accept rental for less than one week. 3 day rentals receive a discount of 20% on weekly rate, 4/5 day rentals a discount of 15% on the seasonal weekly rate. We can accept payment in Euros by bank transfer, or GBP via bank transfer or online booking on this website. *Please note if the house is left in a particularly unclean state at the end of the stay, a £100 extra cleaning fee will be deducted from the security deposit to cover the costs of the extra cleaning necessary.